The Macallan Urwerk Flask: marketing stunt or engineering masterpiece? This week sees the release of a £2,000 whisky flask. It's the result of a joint venture between self-proclaimed 'disruptive Swiss watchmakers' Urwerk and Scotch Whisky distillery, The Macallan. What does it take to be a successful brand manager? I’ll start with an anecdote. A friend of mine left university and joined the graduate training program at a multi-national consumer goods giant. He was assigned to the department responsible for marketing adult incontinence pads. During his first six months on the job, the time came around for the company’s annual staff awards. The brand manager in charge of the product was given an award for his marketing campaign and made an acceptance speech in which he detailed how passionate he was about adult incontinence pads. My friend’s mentor whispered in his ear, “Keep going the way you are and one day that could be you.” My friend resigned the next day and retrained as a sociology teacher. The moral of the story? I guess it’s that to be a successful brand manager you don’t actually need to be passionately connected to the product you’re marketing, you just need to convince those around you that you are. Fast forward to 2017 and we note that the Macallan marketing team have come up with a campaign, in collaboration with Swiss watch makers Urwerk, to develop the most high tech whisky flask ever made. To be fair the Macallan team are no strangers to marketing stunts, but most of them have been pretty amazing - the beautiful Lalique decanters spring to mind. Now, the main objective of a marketing campaign may not be to get people to buy your product. Instead it may really be to get people talking about your brand. In that respect this looks like it will be hugely successful. I mean, look, I’m taking the time to write this piece about it and I’ll then spend a fair bit of effort on social media to make sure you read about it. At first glance the Macallan-Urwerk gadget looks like the sort of whisky flask Iron Man might carry, but then you reflect on how cool Robert Downey Jr. made Tony Stark seem and you realise he wouldn’t touch it with a barge pole. It’s perhaps a bit more Christian Bale’s Batman, dark and humourless. But let’s not judge it on looks alone, we should first examine its feature set. I own a hip-flask which I use a few times a year. It cost me £14.99 from a shop who’s main business is cutting keys and re-healing shoes. Why these shops also always sell hip-flasks has always intrigued me but I digress. I’m going to use my modest hip-flask as a benchmark. 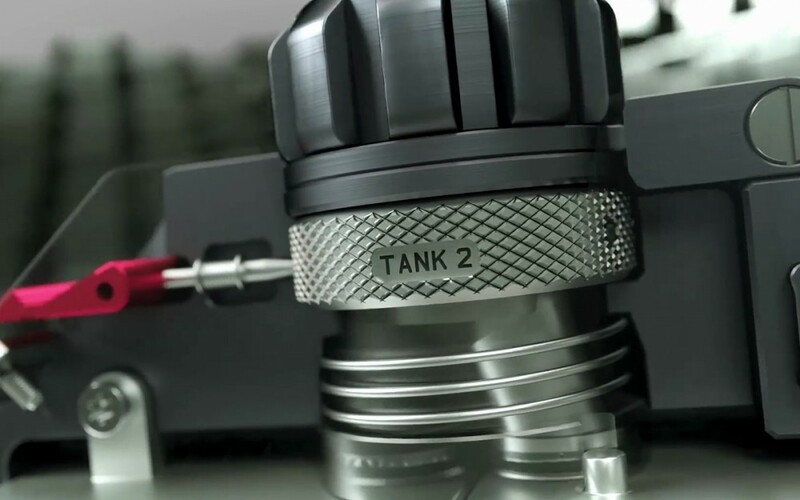 The Urwerk flask has anti-spill ‘flaps’ so it doesn’t fall over when you put it down (they call them flaps in the promo video, personally I might have named them blades or something). My flask doesn’t have any flaps but I usually keep it in my pocket so this hasn’t proved to be a problem so far. It has rotating labels so that you know what is in it. It’s not clear how one adjusts these, but it looks quite fiddly. My flask doesn’t have any labels. So far I’ve never forgotten what’s in it. But maybe as I get older? The flask holds two whiskies at a time in separate tanks. This is where it beats my flask hands down. I am stuck with a single tank model. They say that you can select which tank you drink from by rotating the mouthpiece. Apparently this is so you can drink the good stuff yourself and then switch as you pass it to your friend so that they can drink cheap whisky. This makes complete sense because if you’re going to spend £2000 on a flask you probably can’t afford to share the good stuff. I get round this problem by never putting really good whisky in mine. And there you have it. For more information you can watch the video below. To be fair the Urwerk guys in the video seem to be having a great laugh with it, so it’s probably all a bit tongue in cheek. A flask to stand the test of time. You can apply the term "over-engineered" to Macallan in general. I think they made a mistake releasing this news. It should have been released on April 1. Honestly, can't get over this. Even the Swiss guys can't keep a straight face in the video.